If you are caring for an elderly person, you are going to need to make some adaptations in the bathroom to make it safe for them to use, alone or with assistance. The Caregiver Partnership, has a great line of bathroom safety products that you can purchase to help make the bathroom a safer place for your loved one. One of the most dangerous spots in the bathroom is getting in and out of the bathtub or shower. To help prevent falls inside the shower or tub, you will want to purchase a non-slip suction mat or rubber silicone appliqués. The suction mat is placed inside the tub where the suction cups cling to the bottom of the tub preventing any movement, which gives your loved one a firm footing. Appliqués are based on the same concept; except, you can place them throughout the length of the tub and they don’t come off as mats do. Next to the tub to help prevent falls, you will want to get a non-skid latex-coated bath mat. Another safety feature that you should have in the bathroom is safety bars or garb bars around the bathtub. Never use towel rods as bath aids because they will not support somebody who loses their balance, nor will improperly installed safety bars. When choosing safety bars, you want to choose institutional-grade stainless steel bars, and you will want to install them according to the manufacturer’s directions. Following the manufacturer’s directions will provide you with the best support; the bars won’t pull out of the wall when grabbed. The type, number, and position of the safety bar that you get should depend on the wall space around the tub and the wall structure. You will also need to consider the plumbing arrangements, and any disabilities that the person who is using the tub has. Tub seats are also a great safety feature inside the bathroom. One of the best things about tub seats is that they are removable, so they do not have to be left in the shower if more than one person uses the shower. The portable seats, chairs, or benches make sitting in the bathtub easier because there is no need to sit on the bathtub floor, which can be harder to get up from. You can choose from inside-the-tub chairs that have backs to provide comfort or you can choose an inside/outside transfer bench with adjustable legs. The transfer bench allows the person to sit on the outside part of the bench then slide to the inside of the tub. 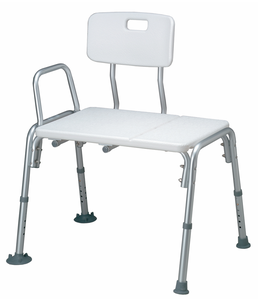 No matter what type of shower chair you select, you want to make sure that it has non-slip rubber tips on each leg and that it is safe and comfortable. Hand-held showerheads are a necessity when using shower chairs because it allows the person to direct where the water is going. The toilet is something else that you need to think about because most standard toilets cause problems for elderly people. Especially elderly with arthritis, hip, knee, or back problems. The best thing that you can do to help these people is to elevate the toilet five to seven inches, as it will give them better leverage when returning to a standing position. The easiest way to increase the height is to get a molded plastic seat; it will raise the toilet seat by about 4 inches. If you need more height, you can use an adjustable toilet seat, which will raise the height anywhere from three to six inches. Garb bars should also be placed around the toilet area for increased safety. Great article - we have to take care of our elderly. In case anyone is looking for a rubber bath mat, lots of hotel suppliers carry them. The one from the link is what we use for my mom. They're not the most attractive, but no slips - and that's all we care about. The bathroom is definitely one of the most dangerous places for seniors but the entire home can be hazardous too. Read How To Make Your Home Elderly-Friendly, it's informative on how to make your entire home elderly safe.